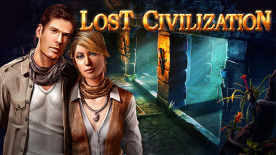 Race to unearth the mystery of a forgotten civilization and rescue your kidnapped fiancé in this atmospheric adventure, suitable for beginners and diehards alike, which features a haunting blend of puzzle-solving and investigation. As amateur archaeologist Sarah, journey from the dark corners of Prague to the forgotten chapters of Mayan civilization as you solve clever puzzles and unravel ancient secrets that could lead to proof that alien life exists on Earth. Featuring over 120 richly-detailed and animated scenes, haunting sound effects, and a refreshing variety of challenges ranging from point-and-click adventuring to hidden object challenges, the fate of the world rests in your hands.